Old Faithful geysir, Yellowstone National Park, Wyoming. Days 1 - Arrive in Salt Lake City, Utah. Salt Lake City is a major international hub with direct flights to many world cities including London. The night is spent in Salt Lake City. Day 2 - Fossil Butte National Monument. This morning we relocate south to Fossil Butte National Monument which is a 2.5 hour drive. We then spend the rest of the morning visiting the Monument which is the site of the famous Green River fish fossils which can be found in fossil shops and museums all around the world. The Monument has a wonderful museum and a scenic walk in the fossil quarry. The collection of fossils is not allowed in US National Parks. However, if the weather conditions are suitable we plan to spend the afternoon at a nearby 'pay to dig' quarry on private land where we will be able to find our own fish fossils. The night is spent is the nearest town, Kemmerer, Wyoming. Day 4. 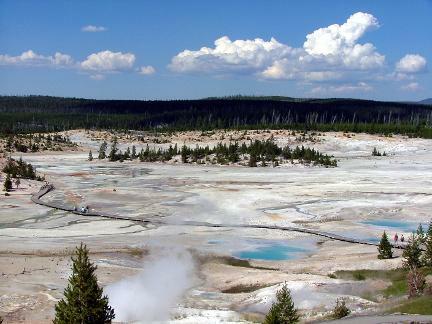 Yellowstone National Park, World Heritage Site. We start our trip in the world's first National Park. Underneath the Park lies the famous super-volcano and we marvel at a volcano’s hidden power rising up in colourful hot springs, mudpots, and geysers. On this first day we visit Mammoth Hot Springs, Sheepeater Cliff, Obsidian Cliff, the Norris Geyser Basin and the Monument Geyser Basin. We also have ample opportunities to observe wildlife along our way. We spend the night in West Yellowstone at the western entrance of the Park. Day 6 - Dinosaur National Monument. In the morning we drive for 3.5 hours passing through the Ashley National Forest in Utah to reach the Dinosaur National Monument. We then spend the whole afternoon at this wonderful site. In the Quarry Exhibit Hall, located over the world-famous Carnegie Dinosaur Quarry we see a wall of approximately 1,500 dinosaur bones including Allosaurus, Apatosaurus, Camarasaurus, Diplodocus and Stegosaurus along with several others. The rocks are from the famous Morrison Formation from the Late Jurassic, 149 million years ago. The monument was founded in 1915 and was the site of several important early dinosaur discoveries. We will also walk the 1.2 mile Fossil Discovery Trail that links the Quarry and the Visitor Centre. Along the trail a number of dinosaur bones can be seen eroding out of the rocks. The night is spent in the nearby town of Naples, Utah. Day 7 - Dinosaurs sites of Fruita, Colorado. We spend our morning relocating, this time down to Fruita in Colorado where we will spend the afternoon. 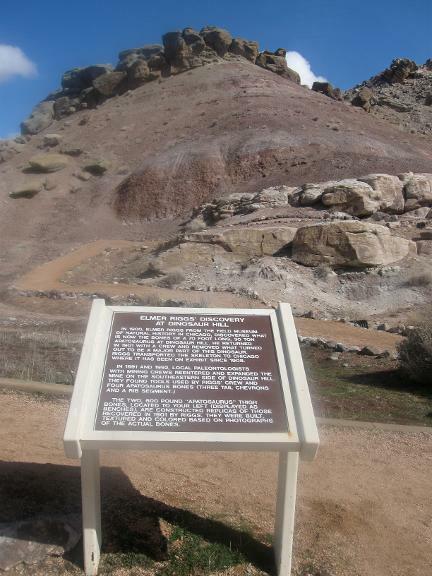 In Fruita we visit Dinosaur Hill where Apatosaurus (Brontosaurus) was discovered in 1901. We also walk the half mile Fruita Paleontological Area Trail which features interpretive signs in this world-class fossils in the Morrison Formation. If time allows, we will also visit the Colorado National Monument with its impressive canyons. The night is spent in Fruita. Day 8 - Dinosaur bones and trackways in the Moab area. The day starts with a 1.5 mile walk around the Trail Through Time trail near Rabbit Valley. The trail, which features interpretative boards, includes a dinosaur quarry which appears to have been an ancient watering hole 140 million years ago, visited by thousands of dinosaurs over thousands of years. The list of dinosaurs found at Trail Through Time is quite extensive, and includes: Apatosaurus, Diplodocus, Brachiosaurus Camarasaurus, Ceratosaurus, Allosaurus, and Nodosaurus. We then continue on to the Copper Ridge Dinosaur Tracksite, which features the tracks of a sauropod (perhaps Diplodocus) and a theropod (perhaps Allosaurs). The many different kinds and sizes of dinosaur tracks, in an excellent state of preservation, make Copper Ridge unique. We then visit the Mill Canyon Dinosaur Tracksite which includes 8 different types of dinosaurs, along with a crocodile resting trace, and we can walk the Mill Canyon Dinosaur Trail where the bones of dinosaurs can be seen in the rocks. We spend the night in Moab. Day 9 - Arches National Park and Canyonlands National Parks. 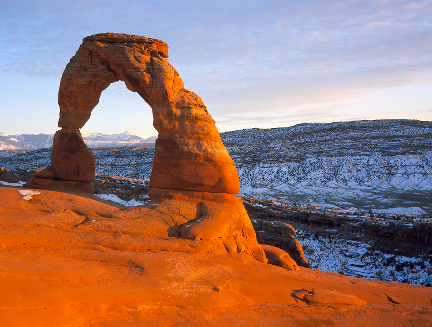 Today we visit the nearby Arches National Park in the morning and in the afternoon we visit the Canyonlands National Park. We return to our hotel in Moab for a second night.